The origins of Reformation are often summarised in theological points about the need to reform the liturgy, the demands to end clerical celibacy, the pressures to have the Bible translated into a language that made it accessible, at least to literate people. There were other stimulants too, including corruption and division within the Papacy, the infrequency of reception of Holy Communion, the lack of expository preaching, except among the mendicant friars, and the endowment and wealth of the monastic foundations. The invention of printing in the 1450s increased literacy among the middle classes, and with that it created a further demand for reading material, including poetry, fiction, drama, travelogues, legal works, but also the Bible and liturgical material. The spread of literacy brought with it the spread of ideas, and the Church was not able to control this. Meanwhile, there was an exodus of scholarship and creativity from the Byzantine world as the Ottoman Empire advanced, and eventually when Byzantium fell to the Turks. These scholars found refuge in Italy first, and their knowledge and wisdom soon spread to other parts of Western and Northern Europe. They brought with them fresh insights. 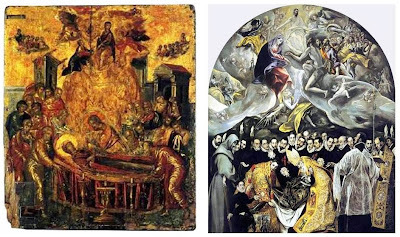 Think, for example, how El Greco’s sense of perspective, influenced by the style of icons in the Byzantine and especially the Cretan tradition, changed Western understandings of art. They also brought with them Patristic texts, which may well have been a contributing stimulus to the Reformation as the Reformers sought to get back to a purer and more simple church from an earlier, post-Apostolic Church. Their arrival also led to a new exploration of Greek philosophy, so that the debates at the time of the Reformation might be easily categorised as debates between Platonism and Aristotelianism. This too was the age of exploration: the age of Christopher Columbus (1451-1506), whose westward voyages (1492-1503) began as an attempt to reach the Indies; and Ferdinand Magellan (1480-1521), who named the Pacific Ocean, and whose expedition (1519-1522) became the first circumnavigation of the Earth. And some time later, it became the age of Galileo Galilei (1564-1642), who was controversial at the time for arguing that the Sun and not the Earth was at the centre of our universe. 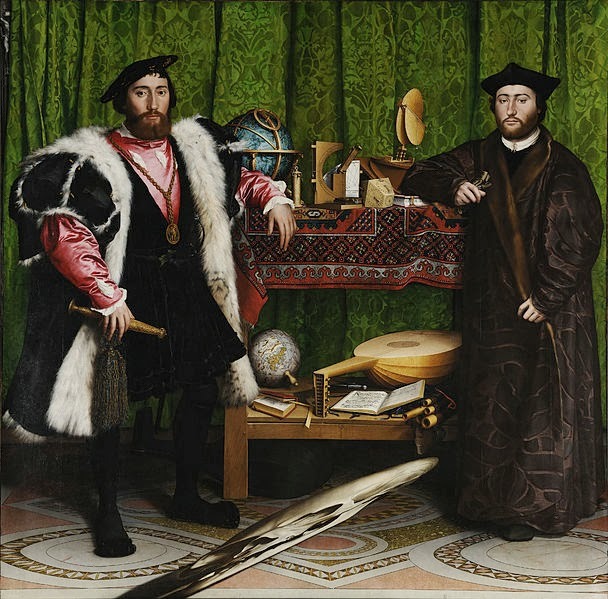 Hans Holbein’s painting of the Ambassadors (1533) shows the ambassadors at the court of Henry VIII standing on the floor mosaic of Westminster Abbey, with not one but two globes, and Luther’s Book of Psalms. And this is also the age that sees the emergence of the concept of the nation-state. Nation states in many ways are identified by their national language, and Martin Luther’s Bible, and Cranmer’s Book of Common Prayer are as much ingredients in meeting this demand as they are an attempt to meet the demands that the Bible and the Liturgy should be available in the language of the people. At same time, as the Church was losing control of states it was also losing control of minds. Erasmus represents the new emerging independent thinking, even among those who remained loyal to the Papacy at the Reformation. The French king secured the right to appoint in all senior Church posts in 1516, a right was later extended to kings in Scotland and England, and to the Emperor of Germany. Was there any one single cause of Reformation? The sale of indulgences may come to mind, but all those factors are important, and they come together at a crucial moment in history. Five hundred years ago, in 1517, Martin Luther (1483-1546), an Augustinian friar and a promising young theology professor, nailed his 95 theses to the door of the castle church in Wittenberg. This is seen as the moment that marks the beginning of the Reformation. But we should note too that his theses are conservative, and attack none of the central dogmas taught from Rome. Luther believed in the real presence of Christ in the Eucharist, and consubstantiation was still a valid theological opinion. 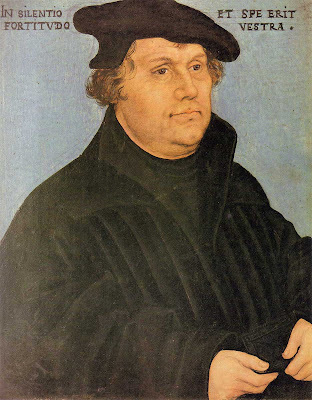 Luther saw himself not as founding a new church but as seeking to reform the Church. His under-girding doctrine was Justification by faith, but even that is not seen as contrary to Catholic doctrine today. The two other key figures in the Continental Reformation were John Calvin (1509-1564), who was only little older than a child when Luther nailed his theses in Wittenberg, and whose Reformation is first associated with Geneva and French-speaking areas; and Ulrich Zwingli (1484-1531) of Zurich, who was strongly influenced by Erasmus. In England, the principal church figure in the Reformation was Thomas Cranmer (1489-1556), who eventually became Archbishop of Canterbury (1533-1555), and was burned at the stake in Oxford on the orders of Mary Tudor. 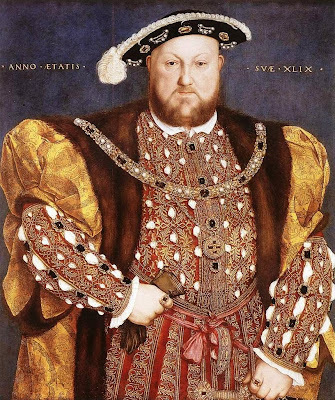 At the beginning of the English Reformation, Henry VIII already controlled the Church in England. Like the kings of France and Scotland, he controlled senior church appointments, including episcopal appointments. It would be wrong to see Henry’s demand for a divorce from Catherine of Aragon in order to father an heir and guarantee the future of the Tudor dynasty as the main inspiration of the English Reformation. Nor was Henry unusual as a ruling monarch for seeking such a divorce – similar demands by other reigning monarchs had been acceded to in the past. But Church leaders were an emerging who were demanding reform. Many of them part of a group that had emerged among students and lecturers in Cambridge. And in their demand for reform, they took advantage of Henry VIII’s dynastic problems. In 1534, a year after Holbein painted his picture of the ambassadors, the Act of Supremacy was passed in England. But little changed under Henry VIII, apart from the translation of some liturgical texts into English. Indeed, the king remained opposed to the abolition of clerical celibacy and Cranmer kept his wife hidden from Henry. As Archbishop of Canterbury, Cranmer was responsible for establishing the first doctrinal and liturgical structures of the Church of England. While he did not make many radical changes in the Church, but succeeded in publishing the first officially authorised vernacular service, the Exhortation and Litany. After the death of Henry VIII, during the reign of Edward VI, Cranmer wrote and compiled the first two editions of The Book of Common Prayer, a complete liturgy for the Church of England. With the help of Continental reformers, he developed new doctrinal standards in areas such as the Eucharist. Was Cranmer a conservative or a radical? His chief concern was to design corporate worship and to encourage a lively faith, yet his 1549 Book of Common Prayer, for example, still used the term Mass. His legacy lives on through The Book of Common Prayer – although it is difficult to ascertain how much of is Cranmer’s own composition – and through the 39 Articles, which are part of his legacy although not his composition. Meanwhile, what was happening in Ireland? In 1536, the Irish Parliament approved Royal Supremacy over the Church in Ireland. All the bishops in the House of Lords accepted the change, but unlike the turn of events in England, the dissolution of the monasteries in Ireland was a slow process. George Browne, Archbishop of Dublin (1536-1554) and a former Augustinian Provincial and Prior, publicly burned images and relics. But many of the bishops continued on as before, although a number of bishops and clergy availed of the opportunity to marry. The first book to be printed in Ireland was The Book of Common Prayer in 1551. George Dowdall (1487-1558), the Archbishop of Armagh (1543-1552), left the country rather than approve its use. John Bale (1495-1563) was, perhaps the most controversial of the Reformation bishops in Ireland. A former Carmelite friar, his crude expressions of his reforming zeal forced him to flee the England of Henry VIII after the execution of Thomas Cromwell in 1540, and to find refuge among English exiles in Germany. He returned to England in 1551 after the accession of Edward VI, and in 1552 he was appointed Bishop of Ossory. His consecration in Christ Church Cathedral, Dublin, on 2 February 1553 became controversial when he refused to have the old rite used, although this was still the only legal rite of consecration in Ireland, and also demanded to receive a Bible instead of a crozier. He was so provocative and controversial a bishop in Kilkenny, that he was forced to flee immediately after the death of Edward VI. After being kidnapped, imprisoned, and held captive, he eventually made his way from Dublin to Switzerland. When Mary Tudor was succeeded by Elizabeth I he still refused to return to Kilkenny. When Mary Tudor became Queen in 1553, she did not abolish the Royal Supremacy, but she deprived many of the clergy who had taken the opportunity provided by the Reformation to marry, including Archbishop George Browne of Dublin, although he became a parish priest and a canon of Saint Patrick’s Cathedral. Mary was succeeded by her half-sister Elizabeth I at the end of 1558. By 1560, the Act of Religious Uniformity passed, and the Act of Supremacy re-enacted. Only two bishops in Ireland – William Walsh of Meath and Thomas Leverous of Kildare (also Dean of Saint Patrick’s Cathedral) – refused to conform and to take the Oath of Supremacy, and both were deprived of their sees. In 1566, all the Irish clergy were ordered to subscribe to a set of 12 Articles, and few refused. The cracks only begin to show later. Peter White, who was Dean of Waterford from 1565, was only deprived in 1570 for his loyalty to Rome … and that is more than a full generation after the beginning of the Anglican Reformation in Ireland. Many of the bishops for decades were and still are accepted as being part of the line of succession of bishops in both churches. As examples, Patrick Walsh is accepted as Bishop of Waterford and Lismore (1551-1578) in both traditions. His contemporary Alexander Devereux, was Bishop of Ferns (1539-1566) through the reigns of Henry VIII, Edward VI, Mary I and the beginning of Elizabeth I’s reign, in both traditions. A well-known example is the case of the infamous Miler Magrath (ca 1523-1622), one of the most corrupt pluralists in Irish Church history. Magrath was Roman Catholic Bishop of Down and Connor (1565-1580), Church of Ireland Bishop of Clogher (1570-1571), Church of Ireland Archbishop of Cashel (1571-1622), twice Church of Ireland Bishop of Waterford and Lismore (1582-1589 and 1592-1608), and Bishop of Killala and Achonry (1613-1622). ● The Bishop of Achonry, Eugene (Owen) O’Hart, who returned to Ireland as the Church of Ireland Bishop of Achonry, but was still recognised as the Roman Catholic bishop. He was buried at Achonry Cathedral when he died in 1603 in the hundredth year of his age, and was succeeded by Miler Magrath. ● The Bishop of Raphoe, Daniel Magonigle, a native of Killybegs, Co Donegal, who was also recognised as the Church of Ireland bishop of the diocese from 1563 until he died in 1589. ● The Bishop of Ross, Thomas O’Herlihy, who died in 1579 – he too is recognised in both the Roman Catholic and Church of Ireland succession lists. Rome continued to hope for the conversion of Elizabeth I and her return to Rome or that people loyal to Rome would stage a political coup and have her replaced as monarch. This hope lingered but was not fulfilled, yet it explains why separate Roman Catholic bishops are not appointed to many Irish bishoprics until the 1580s. For example, Rome leaves John Bale’s former diocese in Ossory vacant until 1582. And even then, Thomas Strong, who was consecrated in 1582, only lived in Kilkenny for a year from 1583 to 1584, and then went back to the Continent, spending the rest of his days as Auxiliary Bishop of Santiago de Compostela until he died in 1602. Despite this “wait-and-see” approach in Rome, and despite the initial support for the reformation among the older English-speaking families within the former Pale, the Anglican Reformation never seems to have taken a full hold on Ireland, and island-wise filed to attract popular support. This is a major question for historians. Why did the Anglican Reformation fail in Ireland? After all, many of the conditions in Ireland at the time were similar to those in England. Why did popular piety continue to be expressed in Catholic devotions? The Prior and Augustinian community of the Priory of the Holy Trinity in Dublin became the Dean and Chapter of Christ Church Cathedral, Dublin. But why did the monastic and mendicant communities continue to survive in the towns despite the legislation for the dissolution of the monasteries? At first, there were few apparent differences in the liturgy in churches in the cities and towns. Priests continued to dress the same way, and even when they accepted the Reformation, they often continued to use Latin as a liturgical language, which was allowed by law – to this day it is still legal to use Latin versions of The Book of Common Prayer, Liber Precum Publicarum, in the chapels of Cambridge, Oxford, Windsor and Eton, where it was presumed both dons and students knew Latin. Trinity College Dublin was not founded until 1592, two generations after the beginning of the Anglican Reformation. Families that had once sent their best and brightest sons to Oxford and Cambridge to study theology and to train for the priesthood, had no place to send them in Ireland, and were now sending them to Spain, Portugal, Italy, France and the Low Countries. No Irish-born clergy who might provide the next generation of clerical leadership were being educated in Ireland, and so English-born and English-educated bishops were imposed on dioceses. This was not just a demonstration of insensitivity, but it created a major cultural barrier for both English-speaking and Irish-speaking communities on the island. Although the 1549 The Book of Common Prayer was the first book printed in English in Ireland, the first Irish-language version of The Book of Common Prayer was not produced until the 1580s, and the first Bible was not available in Irish not until 1603. Was all this too little and too late? And yet, the Church of Ireland was a learned church with great scholars among the bishops and archbishops. James Ussher (1581-1656), Provost and Vice-Chancellor of Trinity College Dublin, Bishop of Meath (1621-1625) and Archbishop of Armagh (1625-1656), was a Dublin-born scholar of European reputation, known for his learning in Biblical and Patristic studies. It was he who dated creation to 4004 BC; but he also rescued the Book of Kells and presented it to Library of Trinity College Dublin. William Bedell (1571-1642), the saintly and martyred Bishop of Kilmore (1629-1642), introduced teaching of Irish into Trinity College Dublin when he was provost (1627-1629), would only appoint Irish-speakers to parishes, held Irish services, translated prayers and also translated the Old Testament. But by then, there was a resurgence in popular Catholicism, while Presbyterianism making major inroads in Ulster from neighbouring Scotland. The 1641 Rebellion was traumatic for the Church of Ireland, and the subsequent victims included Bedell. In Kilkenny, for example, churches that had been held by the Church of Ireland became Roman Catholic churches, and David Rothe moved into Saint Canice’s Cathedral as Bishop of Ossory. Throughout the dioceses of Ireland, communion silver was stolen or re-appropriated, depending on your perspective, and in many cases cathedral records burned. With Cromwell’s arrival, Roman Catholics and Anglicans suffered alike. The Church of Ireland forced underground, The Book of Common Prayer was banned, and the clergy and bishops, with few exceptions, were dismissed. The lie or myth perpetuated in many places that the Church of Ireland is the Church of the Cromwellians is simply not true. With the restoration of Charles II and the monarchy in 1660, the Church of Ireland was restored too, with its bishops and with a revision of The Book of Common Prayer in 1662. 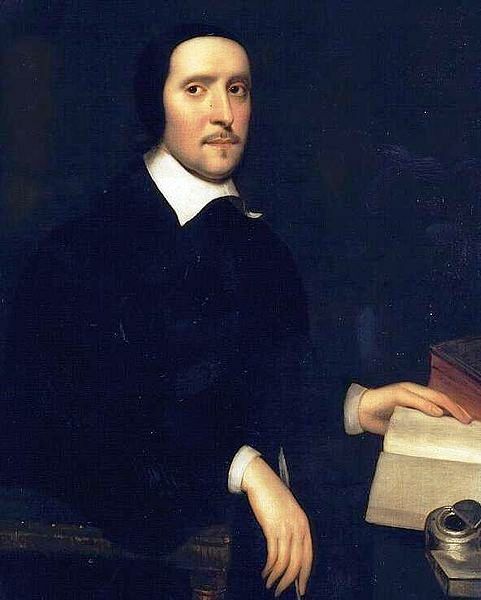 The Caroline Divines, the great Anglican theologians who provided the new leadership from the 1660s, restored much of the Catholic order, liturgy and practice in the Church of Ireland and the Church of England that had been in danger of being lost after the Reformation. They included, most notably, Jeremy Taylor (1613-1667), who was appointed Bishop of Down and Connor and Vice-Provost of Trinity College Dublin 1660, and, in addition, Bishop of Dromore, in 1661. His Eucharistic theology in many ways prefigures the ARCIC (Anglican Roman Catholic International Commission) agreements of the late 20th century, having strongly markedly the Anglican co-chair, Archbishop Henry McAdoo of Dublin. 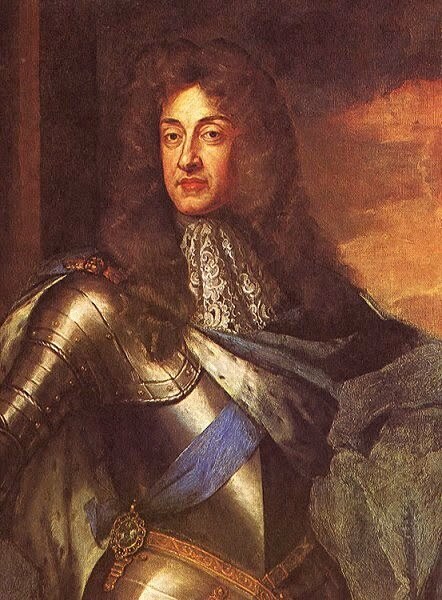 But a new crisis for Anglicanism emerged in 1685 with the accession of James II to the throne. Francis Marsh (1626-1693), Archbishop of Dublin from 1681, was attainted by Parliament, and fled to England, where he was joined in exile by many other bishops of the Church of Ireland. During the short reign of James II, the Church of Ireland was effectively disendowed. The Roman Catholic Church, which had operated clandestinely since the time of Cromwell, was in the open again. Church of Ireland churches were taken over – by 1690 20 churches in the Archdiocese of Dublin alone – and fresh appointments made to deaneries and other positions. Alexius Stafford from Wexford was appointed dean of Christ Church in place of William Moreton in 1686. The cathedral accounts show that the Church of Ireland dean and chapter were still there until 1689, but a Catholic altar was set up and Mass was celebrated in the cathedral. 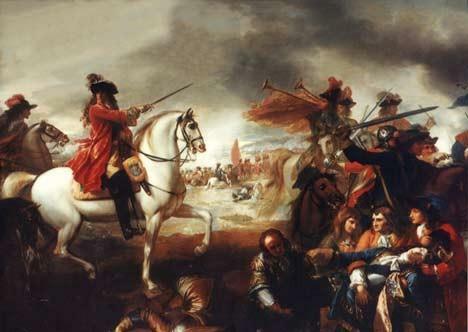 The defeat of James II at the Battle of the Boyne in 1690 brought many of the Church of Ireland bishops and clergy back from exile, and secured the establishment of the Church of Ireland. And just as the Battle of the Boyne was not fought on 12 July, the battle-lines at the Boyne were not drawn along a clear Catholic, Protestant divide. We know that the Pope prayed for William III, for James was an ally of the King of France, who posed a greater threat to the independence of the Papacy. On the other hand, a considerable minority of Anglican clergy refused the new oaths, were deprived, and became the Nonjurors. They include: William Sheridan (1637-1711), Bishop of Kilmore and Ardagh; Thomas Otway (1616-1693), Archdeacon of Armagh; the Archdeacon of Connor, John Baynard (ca 1645-post 1689); the Chancellor of Connor, Chares Leslie (1650-1722); the Treasurer of Connor, William Jones (ca 1654-post 1692), William Jones; the Archdeacon of Dublin, John Fitzgerald (1643-post 1701); the Dean of Lismore, Barzillai Jones (ca 1654-post 1708); and a leading Fellow of Trinity College Dublin, Henry Dodwell (1641-1711). After the Battle of the Boyne and the Treaty of Limerick, there was still a lingering suspicion in some political quarters that many of the bishops and senior clergy of the Church of Ireland retained some lingering Jacobite sympathies. As the 18th century unfolded, the Georgian era saw an even closer identity of Church and State. But corruption was rife among clergy and bishops and the bench of bishops as often packed with English-born favourites. The bishops often provided a working majority in the House of Lords in Dublin, and at a local level some rectors were also magistrates. 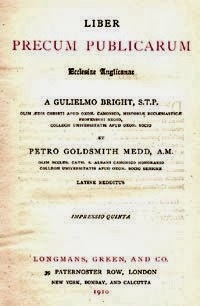 So it became a popular perception in some places that the Penal Laws were enacted by the bishops and enforced by the local clergy, while there was a growing resentment in the rural areas that the tithes collected from farm produce was being used to maintain the clergy of the Church of Ireland. Of course, we should also remember that the Penal Laws were as much resented by Presbyterians as they were by Roman Catholics. But we should not pain a monochrome picture of the Church of Ireland at this time, and it was only a minority of church leaders who were careerists and non-resident pluralists. For the Church of Ireland at this time was also the Church of great thinkers such as the writer Jonathan Swift (1667-1745), who was Dean of Saint Patrick’s Cathedral Dublin (1713-1745), and the philosopher George Berkeley (1685-1753), who was Bishop of Cloyne (1734-1753). The Penal Laws began to be relaxed around the time of the American War of Independence (1776), with an extension of the rights to enter professions and education. The paradox of Church of Ireland identity and the place of members of the Church in Irish political society is perhaps exemplified in the person of Henry Grattan, who led the demand in Grattan’s Parliament for Irish autonomy and independence. As the 18th century drew to a close, both the Orange Order and Maynooth were established in 1795, and it should be remembered that Maynooth was founded by royal charter as the Royal College of Saint Patrick at Maynooth. The Act of Union in 1800 united the Parliaments of Westminster and Dublin, bur also united the Church of Ireland and the Church of England. It was welcomed by many who had previously been sympathetic to Grattan. For example, Thomas Lewis O’Beirne, Bishop of Meath, saw the Act of Union as breaking the influence of landed aristocratic families, including the Beresfords and the Ponsonbys, and as a way of reforming the Church of Ireland. The Beresfords and Ponsonbys must have appeared to have used the Church as a good alternative career path for many of their younger sons who became bishops. But they were not alone. Lord Kilmorey had no bishop to check his ecclesiastical rule in tiny Exempt district of Newry and Mourne, squeezed between the Dioceses of Dromore and Armagh. Among the landed aristocracy: the Earl of Mayo who was also Archbishop of Tuam, and secured for his son the post of Dean of Saint Canice’s, Kilkenny. At the Act of Union, the structures of the Church of Ireland were badly in need of reform and the bishops were incapable of or unwilling to introduce that reform. At the end of the 18th century, the Church of Ireland was served by four archbishops and 18 bishops. For its bishop, the See of Derry was worth £7,000 a year, more than any of the archbishoprics, except Armagh at £8,000, while the bishops of Ossory and Dromore had a mere £2,000 each. And yet in some of the dioceses – including the Diocese of Kildare and the Diocese of Down – the bishop had no fixed, official residence. The cathedral system was cumbersome, over-burdening the Church and providing titles for absentee clergy who performed no services for the Church of Ireland. In some instances, there were dioceses where there was no cathedral. One of these was the Diocese of Ardfert and Aghadoe, covering most of Co Kerry. Saint Brendan’s Cathedral, Ardfert, outside Tralee, was burned down in 1641, and would only be restored briefly in 1871, to be abandoned almost immediately once again. Despite its name, Aghadoe Cathedral, outside Killarney, never had been a cathedral. Yet, at the end of the 18th century, the Diocese of Ardfert and Aghadoe had a full panoply of cathedral dignitaries, including a dean, precentor, chancellor, treasurer and two archdeacons, one each for Ardfert and Aghadoe. The Diocese of Kilmacduagh was extremely small, being less than 30 km long and less than 20 km wide. Saint Colman’s Cathedral, outside Gort, Co Galway, had been in ruins since the 1650s, and the parish church in Gort served as the cathedral church for this miniature diocese, which had few parishes and which had been united to the Diocese of Clonfert since 1602. Yet the tithes of this tiny part of south Co Galway were used to pay a Dean of Kilmacduagh, a provost, a chancellor, an archdeacon and two prebendaries, who continued to be installed in their dignities on top of tombstones and nettles in the roofless cathedral building until at least 1874. But we should not forget that this was also a time of intellectual and spiritual growth too, producing missionaries such as George Berekely, the philosopher bishop who had also been a missionary, and Charles Inglis from Co Doneal, who was the first Anglican bishop consecrated for North America. It was a time that was witnessing the growth of many charities and charitable institutions, including the Rotunda Hospital and Saint Patrick’s Hospital in Dublin. It was a time that saw the Wesley brothers John and Charles visiting Ireland frequently and preaching regularly in Church of Ireland churches at the early stages in the Rise of Methodism – John Wesley first visited Ireland in 1747. It was a period that saw the foundation of schools, Sunday schools and charities. 6: Church History, From the Act of Union to today. (Revd Canon Professor) Patrick Comerford is Lecturer in Anglicanism, Liturgy and Church History, the Church of Ireland Theological Institute, and an Adjunct Assistant Professor, Trinity College, Dublin. This lecture was delivered in the Mater Dei Institute of Education, Dublin, on 19 November 2015. Mater Dei Institute of Education (MDI) is a College of Dublin City University (DCU). Thank you for the post. For more on John Wesley, I would like to invite you to the website for the book series, The Asbury Triptych Series. The trilogy based on the life of Francis Asbury, the young protégé of John Wesley and George Whitefield, opens with the book, Black Country. The opening novel in this three-book series details the amazing movement of Wesley and Whitefield in England and Ireland as well as its life-changing effect on a Great Britain sadly in need of transformation. Black Country also details the Wesleyan movement's effect on the future leader of Christianity in the American colonies, Francis Asbury. The website for the book series is www.francisasburytriptych.com. Please enjoy the numerous articles on the website. Again, thank you, for the post.